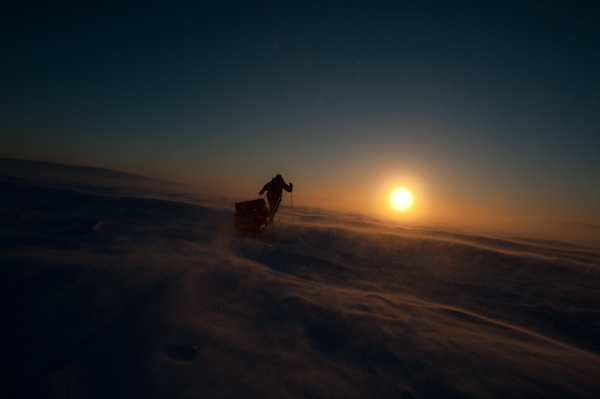 This is the long way across the Finnmark Plateau at the coldest time of the year. 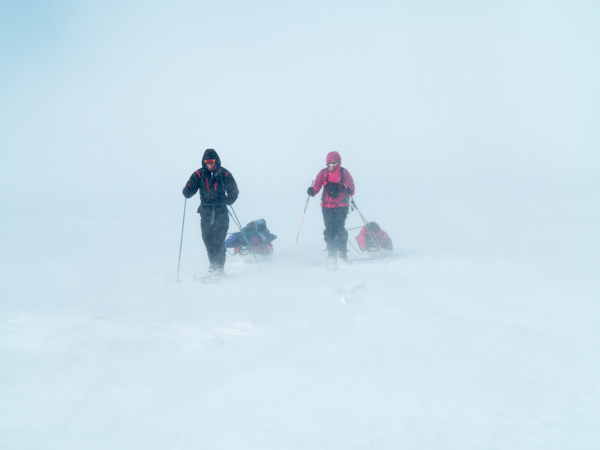 The low temperatures, the changing snow conditions, the few hours of daylight and no other people in sight makes this an Arctic challenge for the true adventurers and explorers. 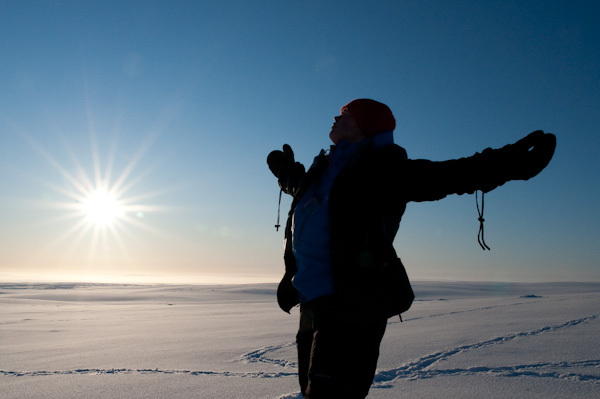 -And the reward; images of magnificent untouched nature forever burned into your memory, the indescribable Arctic light, a relaxed mind and the rewarding feeling of having done one of the toughest Arctic challenges available in mainland Scandinavia. Warning: An adventure like this can be adictive. With this tour you get the opportunity to test yourself and your equipment. 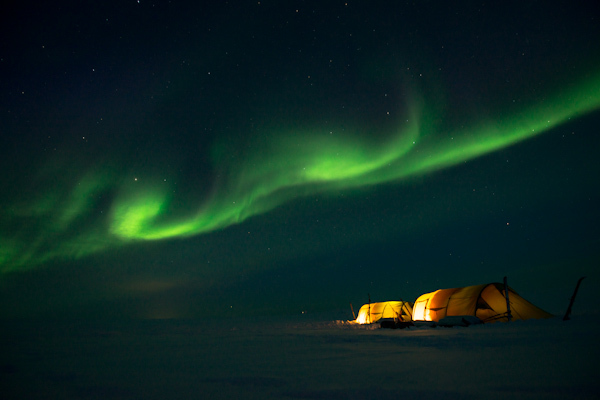 You can gain valuable expedition experience before going to Greenland, Antarctica or to the North Pole. The program is 17 days and starts around mid-February. This is the coldest period of the year and the light is stunning. If you have no other expedition or tour plans, this tour has so much to offer in itself. Your mind changes mode when you are out beyond 8 or 9 days without contact with civilization. The white landscape, the silence and the meditative motions of cross country skiing will give you plenty of time to reflect, philosophise and day dream along the way. Many people find themselves in a very balanced, relaxed and harmonic state of mind after a trip like this. This expedition holiday is suitable for adventurous people with strength of will and a can-do attitude. It requires a good level of fitness and previous camping and outdoor experience. The route goes from north to south and ends up in Karasjok, the Norwegian Sami capital. We will be skiing the whole way transporting our equipment in pulks and back packs. Almost the entire route will be off track and our daily skiing distances will be between 7 and 22km. Total distance will be between 160- 210 km, depending on our starting point, which will be decided based on group size and composition, weather forecast, snow conditions and other factors that might influence us during the trip. We will be skiing during the coldest period of the year when the temperature can drop to below -40°c and the weather can vary from clear blue skies with no wind to storms or blizzards. This will challenge you both physically and mentally, but it will also bring forward friendship, character, cooperation, grand nature experiences and a wilderness feeling that few other places in Europe can offer. The guides on the expedition are very experienced and highly qualified for this type of expedition. Their most important task and their main focus will be making this the best possible experience for you. 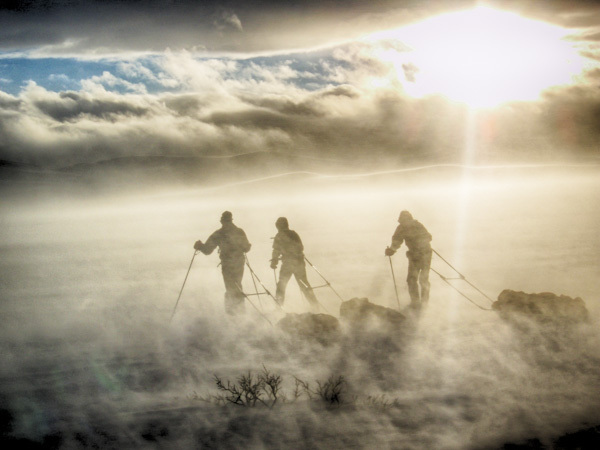 The American travel publiation Forbes Travel Guide has ranked the skiing trip on the Finnmark Plateau to be one of the 5 most stunning cross country skiing spots in the world. 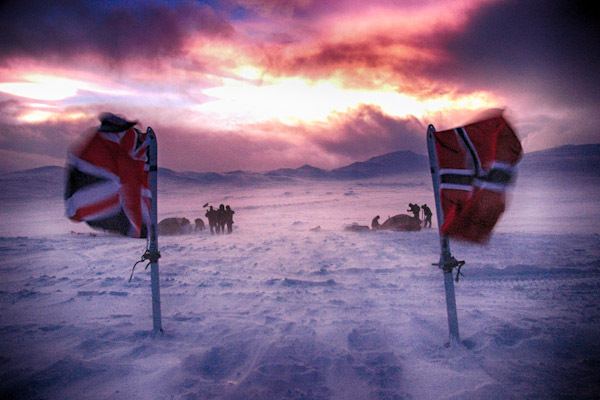 Link to an article about our skiing trips on Northern Norway tourist board. - Average temperature approx. -15 C.
- Temperatures can drop down to approx. -40 C.
- Sunrise around 8:20am and sunset around 3pm at the start of the trip. - During the trip the days will become more than 2 hours longer. Day 2 Continue preparations. Last minute purchases. Driving to our starting point. Arrival day: You arrive at Alta airport where your guide will meet you and take you to a local guesthouse/cabin in the town of Alta. After dinner you will be briefed on the route of the expedition and we will go through your equipment to see and evaluate whether it will be sufficient for the expedition. We will talk through subjects like first aid, safety and how to avoid frost injuries. 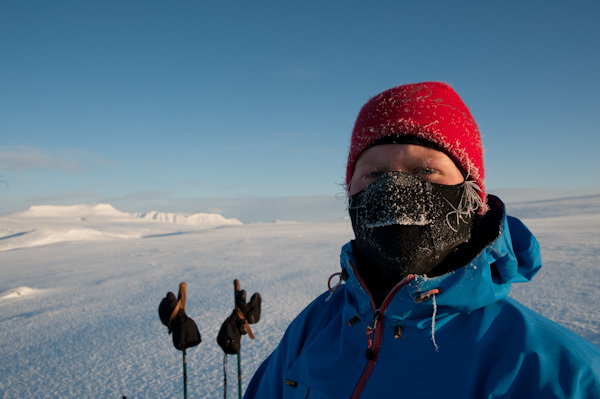 Day two we will spent preparing for the expedition and taking the first pole strokes on our way to Karasjok. 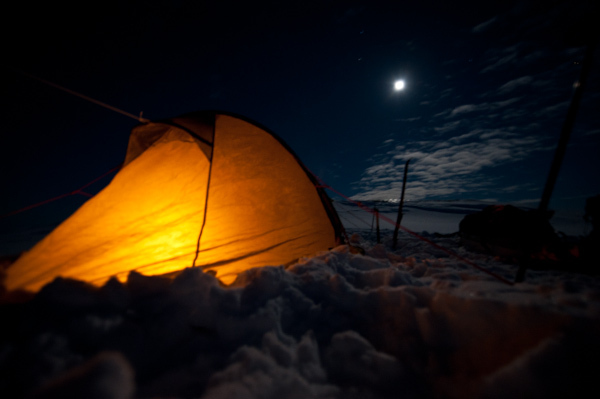 We will put together teams of two or three that will work and stay together in the tents throughout the expedition. We will do our final purchases in the town, test and pack our equipment before we depart for our starting point. 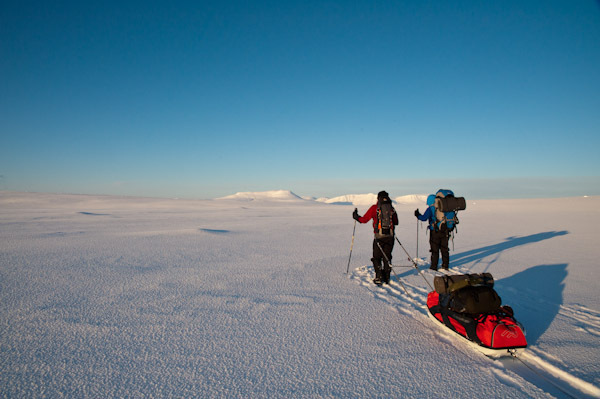 On this first day of the expedition we will be skiing only a few kilometres before we set up our camp for the night. This is to give you the best possible start and to give you the opportunity to adapt to the situation and to make adjustments to your equipment. The exact starting point will be desided based on group size and composition, weather forecast, snow conditions and other factors that could influence us on the trip. 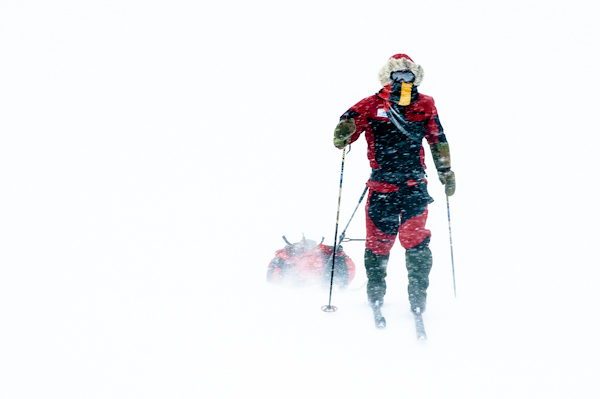 We will be skiing an average of 15 to 20 kilometers per day. Some days this will mean skiing into the dark hours of the day. Our goal is Karasjok and Engholm Husky Lodge where hot showers and a nice meal is waiting. The lanscape will vary from mountainous terrain with steep slopes and narrow vallies by the coast to the typically flat terrain with rooling hills and scattered patches of wood on the inland mountain plateau. Day sixteen is an extra day. We need to have this day as a back-up in the event that we get weather-bound while we are on the plateau or anything unforeseen should happen. If we reach our goal on day 15 these extra day can be spent exploring Karasjok and Engholm Husky Lodge. Karasjok is a small town situated in the heartland of the Sámi culture. Here you can visit the Sámi parliament, the Sámi museum and the local knife smith or silver smith. You can also by other traditional Sámi handcraft. At Engholm Husky lodge there are always many things happening. You can take part in the daily life at the lodge, you can choose to read a book from “the mushers library” or book a dogsledding daytrip or a visit to a reindeer herder. Day seventeen is your departure day. However we would like to encourage you to stay a few extra days to explore Karasjok, the neighbouring town Kautokeino or Engholm Husky Lodge. - Items marked with * can be provided by Turgleder on request for free or at an additional cost. Any additional cost is given in parenthesis. Information about equipment you need must be conveyed to Turgleder minimum 1 week before arrival. - We also strongly recommend that you bring a down jacket (and pants) to put on in camp and when we are not moving, however this is only for comfort and is not vital for the expedition. 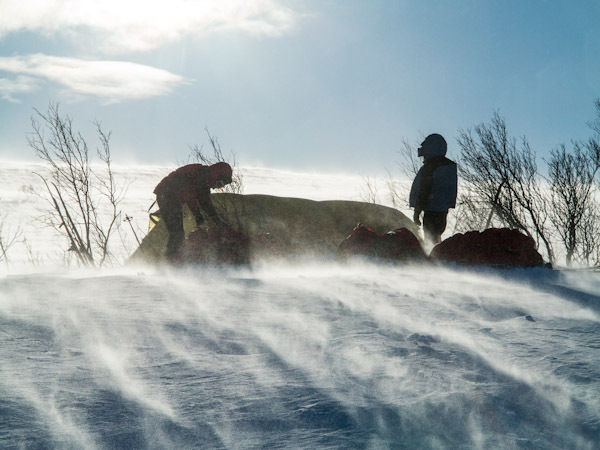 Equipment that you do not need on the expedition can be transported from Alta to Karasjok. Private trips are available on request. From December to May. Local transportation, all meals from dinner on day 1 to breakfast on day 17, lodging in Alta one night and one or two nights in Karasjok (day 16 and day 15 if back from trip earlier), some clothing and equipment (see eqiupment list).